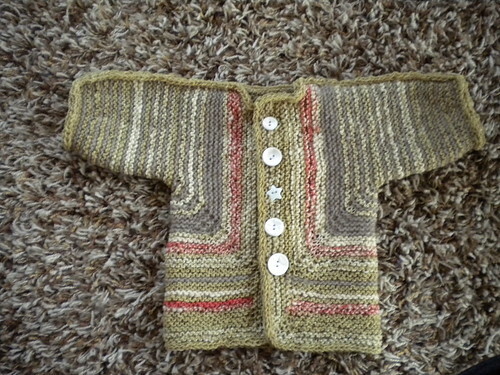 First, go check out the Baby Surprise Jacket that Rachel Marie of Knitty Dirty Girl just knit- clearly we are on the same wavelength of BSJ knitting! Hers is her handdyed yarn with some of my Midnightsky Fibers handspun. She is always so fast on getting stuff up on Ravelry, I am lucky if I even TALK about finished projects, much less getting pictures of them on ravelry! My latest BSJ is in my naturally dyed handspun and the remaining recycled cashmere from the unraveled shawl. Actually, the ENTIRE thing is from leftover and recycled yarns, since the handspun was yarn I was using to weave a handspun scarf. I just sold my loom though, so until I find one that doesn't bruise my knees (and folds up even smaller!) 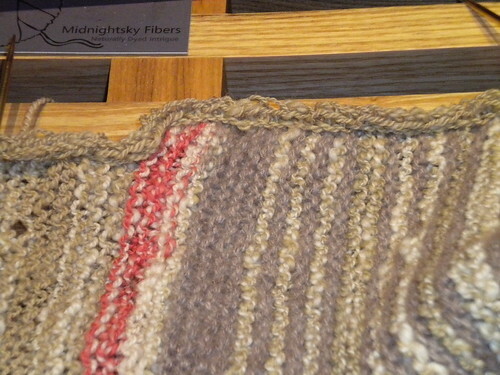 there won't be many more handspun woven scarves! At any rate, I spun the yarn for this up on my new super fast lendrum flyer, which is quite exciting since it has some of the fastest ratios availble on a spinning wheel! The yarns are thick lace/light sock weight, and one is a medium sock weight. The buttons are all reclaimed, given to me in swaps, etc. They all are the same white tone, but each is a little different. I put it through my front loading washer (twice!) to full it a bit and make it fluff out a bit. Side benefit it that it lightly felts the ends together, which is good since the cashmere is spit spliced together in a bunch of places! 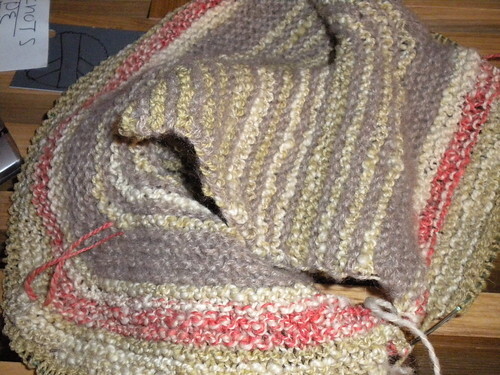 I totally edged it in icord before sewing it up!